SIDNEY, BC – Celebrate the 3rd Annual Peninsula ArtSea Festival at the Shaw Ocean Discovery Centre from October 15th to 21th by painting with the fishes! Teachers with students in grades 5-12 are invited to join us for a special program titled Art in the Aquarium offered from Mon-Thurs at the Shaw Ocean Discovery Centre during the ArtSea Festival. The idea is to have students explore our Centre and glean inspiration from the vibrant fauna and flora they see around them. 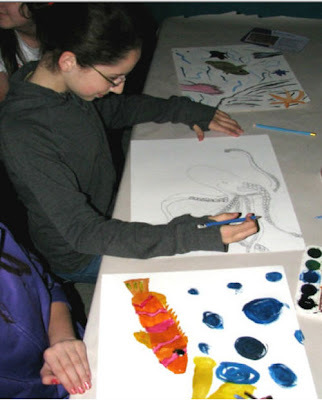 They will then be invited to sit down in front of their favorite creature and use watercolors, pastels, and sketching pencils to recreate what they see. It’s a fantastic way to combine an unlikely duo: marine science and art! (Classes MUST pre-book; call 250-665-7511 for more information). On Friday and Saturday (20th & 21st) general admission visitors will have the opportunity to get ArtSea too! Various stations will be set up throughout the Centre all day long for all guests to enjoy. Stations will include crafts and activities, such as “Create a Creature” which challenges visitors to construct a marine animal out of recyclables. Who knew that paper towel rolls could make such life-like replicas of sea cucumbers? Us, that’s who! In addition to art and activities, local sculptor Fred Dobbs will be joining us at the Centre from noon to 4pm Monday through Friday as our resident artist. Fred will spend his time actively working on his current sculpture, Mother of Pearl, and will also lend his expertise to our budding young artists. Shaw Ocean Discovery Centre’s Visitor Experience Director, Tina Kelly, has been looking forward to welcoming ArtSea enthusiasts again this year after its huge success in the past. “This is the third time we’ve offered Art in the Aquarium here at the Centre, and I’m always amazed to see the fantastic work that kids can create…and adults too!” says Kelly. “We’re really looking forward to watching the creative process unfold”. And capping it all off, there will be a ‘Thank You’ event hosted by ArtSea for all of the local artists and businesses who participated and made the Festival possible. The event is by invitation only, and will be held at the Shaw Ocean Discovery Centre on Wednesday October 17th from 7pm to 9pm.